We use modern, certified equipment and the best all around instruction by Certified HPAC instructors. 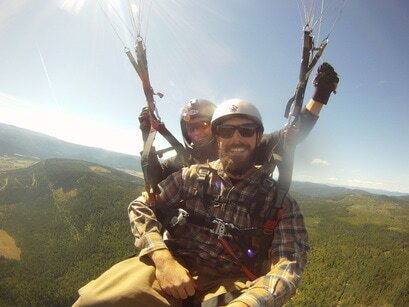 Paragliding and the motorized trike flights are $200 and hang gliding is $225. ​All include HD video and/or digital photos at no extra charge. Lessons in all three types of flying are available and all equipment is provided. 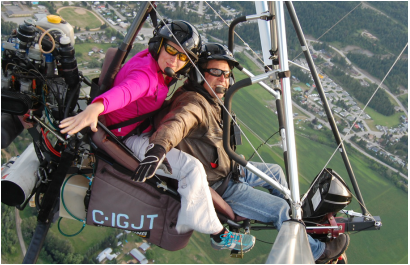 Come and pursue the freedom to fly with the ravens, hawks and eagles at the Freedom Flight School in the Okanagan Valley, BC, Canada. ​Essentially a large parachute, a paraglider is a wing that flies slowly through the air. You sit upright and the flight can be calm & meditative or a wild invisible roller coaster ride in the sky! This flexible yet rigid wing is the closest thing to flying like a bird. 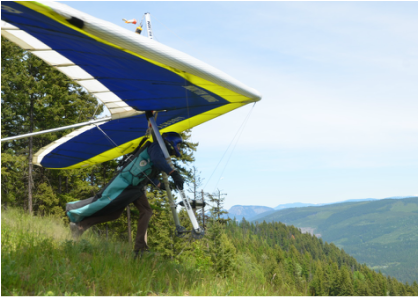 The pilot is in a suspended harness and controls the wing by shifting body weight and foot-launches from a hill. Don't like the idea of running off of a mountain but you want to experience the raw essence of flying? A trike takes off and lands from a runway like a plane but the engine can be turned off during flight and you can soar in the thermals...it can be the best of both worlds!